Without LTZ. Product Type: Grille. Product Condition: NEW. com in order to receive updates regarding your order. Processing Details. 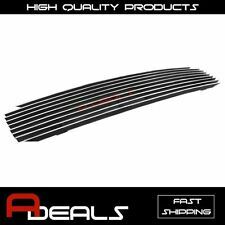 Taken from a 91 Caprice, this OEM grille is in really good condition. The chrome shines up nicely, although there are a few nicks, scratches & pitting they are not significant unless really close up. Note one small crack in upper right corner. See pics & expand them for details. THIS GRILLE IS NICE AND SHINY! several different colors and styles of this grille. This is for the 4-door sedan models only! Part Number:10220511. Manufacturer's part number on the rear of the part are 10220511 10220510 10220509. 1991-1996Chevrolet Caprice. Manufacturer Part Number10220509. Discover Network. Master Card. Headlights & Components. Compatible Vehicle(s). 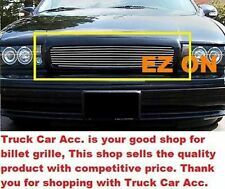 NEW FOR CHEVROLET CAPRICE FRONT GRILLE ASSEMBLY GM1200113 FITS 1991-1996 4-Door. Interchange Part Number GM1200113. With our arrival strategy, there are no unique gets or special cases. Newly arrived nerf bars, bull bars, bed covers and hitches. Material Stainless Steel. Local pickup is acceptable in California only. Part NO. : GM1200450,10269614. in the following situation OPEN A CASE. NEW & USED PARTS FOR LESS. Manufacture Part number :10220510. BLACK "SS" GRILL. 93-96 CHEVY IMPALA ! GOT A BROKEN GRILL OR WANT. TO GIVE YOUR CAR THE "SS" LOOK. THIS ALSO FITS THE 91-96 CHEVY CAPRICE. THEY WILL BE GONE BEFORE YOU KNOW IT! 1991-1996 Chevy Caprice. Insert billet grille might involves taking off the factory grille, but cutting work is not required. 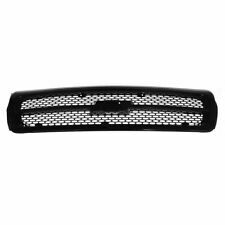 Air craft grade 6061-T6 aluminum solid billet grille insert can protect the front end of your vehicle. Part NO. : GM1200450,10269614(GRILLE). CORNER LAMP: 5976556(R). in the following situation OPEN A CASE. Looking for a way to add a little style to Caprice?. 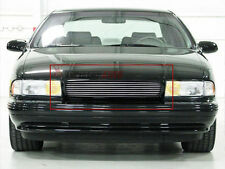 Grille will fit the 1991 - 1996 Chevrolet Caprice. FITS 1991-1996 CHEVROLET CAPRICE. E&G HORIZONTAL CLASSIC GRILLE. No wire ties are used. Installation should take about an hour. Material: Stainless Steel. - If product fits your vehicle. - About international order. - How to place/cancel an order. Within the 48 U.S. States. We respect your privacy, won't give away your personal information to anyone. CORNER LAMP. DOOR HANDLE. in the following situation OPEN A CASE. Enhance the style or function of the original OEM grille. High Grade Stainless Steel. Cancel Oder ALL OTHER COUNTRIES. AK, GU, HI, PR, APO, US Territories and PO Box. U.S. (non-48 States). Special Notes. CAPRICE Genuine OEM: Yes. And there is a chip towards the driver side Has overspray throughout the grille. Product Type: Grille. Product Condition: NEW. com in order to receive updates regarding your order. Processing Details. 1991-1996Chevrolet Caprice. RELATED PRODUCTS. Discover Network. Master Card. 1991-1996Chevrolet Caprice. RELATED PRODUCTS. Discover Network. Master Card. compatible vehicle(s). Condition: As pictured. Cleaned and ready to install. Mounting hardware is pictured and included. What is pictured, is listed. PARTS ARE SOLD AS IS WITH NO WARRANTY. 1991-1996 Chevrolet Caprice. In order to keep our prices low, we have the following purchasing policies 18:00PM 9:00AM. We're here for you!